Sophronia Tent. Rendering courtesy the artist. 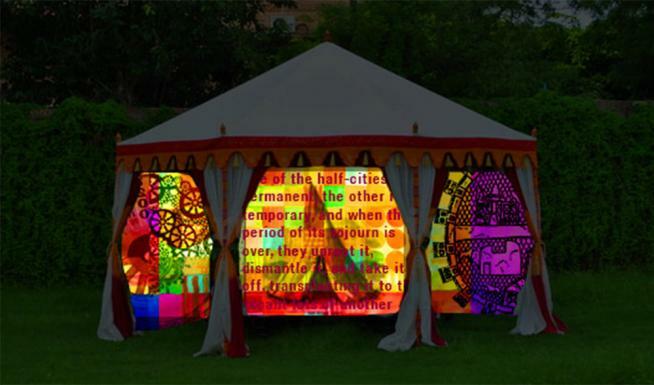 Inspired by Calvino’s imaginary cities, Graffiti Angel in Sophronia is an interactive multimedia work by Joellyn Rock, Kathy McTavish, and Rob Wittig that mixes video, images, music, and text to create a second Sophronia. Improvising on audience suggestions, a team of Netprov (networked improv narrative) writers weave in stories of the half-cities. Visitors can contribute on Twitter at #sophroniatwo or learn more at sophroniatwo.com.